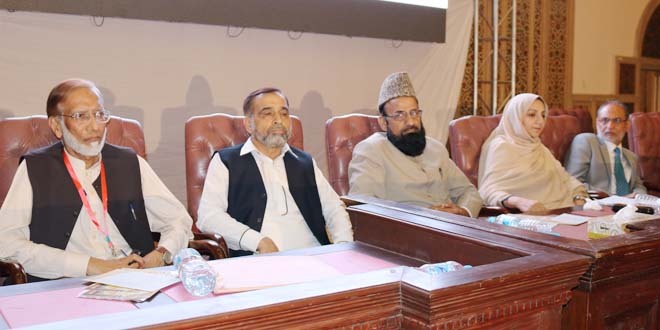 Lahore, 1st April 2018: On the last day of 25th Biennial Convention of PIMA here at Aiwan e Iqbal Lahore, several important deliberation were held. In a special session: “Medical profession – issues and challenges”, PIMA experts highlighted major issues in Pakistan. They stressed on prioritizing prevention, provision of clean water, environmental safety and vaccination. PIMA urged government to ensure transparency in admission to medical colleges; solve the scarcity of doctors available for service due to large dropouts after graduation; improve coordination between PMDC, CPSP, doctor’s bodies, and the government. Federal health minister, Saira Afzal Tarar announced the ‘National Health Vision’ aimed at addressing all such problems. She told that government has increased the health budget, is striving to improve coordination between center and provinces, and invited doctor’s bodies to help government in reaching masses for effective Polio vaccination and women health.